This entry was posted on April 30, 2012 at 1:20 am and is filed under IV. Columns, Modern History, VII. Research with tags 18th Division, ARVN, Battle of Xuan Loc, Black April, Le Minh Dao, Lest We Forget, South Vietnam, Vietnam War. You can follow any responses to this entry through the RSS 2.0 feed. You can leave a response, or trackback from your own site. all South Vietnamese army is my Hero. A true inspiration. A true great figure of Viet Nam. A true example of our fatherland’s strength. Yes! I knew place called: “Long Khanh Cua Heo Battleground” on Highway 1, near [Thi Xã] Town of Long Khanh. That place has big battles between 18th Division of ARVN, fighting with NVA-Viet Cong Army. After the war, I has living outside of Long Khanh. Town near CUA HEO areas in 1977. So, I knew well about what happens in Long Khanh Town, before Fall of Saigon on April 30, 1975. On September 2010, I drove Motor Bicycle from Dalat to Long Khanh- Bà Rịa-Vung Tau-Saigon. I stayed over night at Hotel in Cua Heo-Long Khanh Town. A men owner Hotel is Captain, former officer of 18th Divisions of ARVN. I heard his talked about “CUA HEO Battleground, and General Lê Minh Đạo in Resisted of Long Khanh Town. Thanks for email information. Best Regards, Greeting from Yến Vỹ, Chùa Hương-Ha Tay@Hanoi. Xuan Loc demonstrated when military leaders were good, ARVN was willing to fight.Too bad that South Vietnamese brass cared more about their grip of power than to win a war. There was a battle in Tan Son Nhat where the paratroopers fought until they ran out of ammunitions. Their officers told them to leave to take care of their families! Another story in 1968.A young captiain with his special forces (those with the head of black panther) witheld two regiments of NVA in the citadel to prevent the MACV to be overrun. This heroic resistance greatly help the US force to take back Hue airport and the city. The captain recieved the US highest distinction ever given to a Vietnamese officer. After 1975, he was in reeducation camp but was liberated by US request and appointed colonel.. He lives now in Florida. How can I contact Le Minh Dao? I would like to interview him. Were you able to contact the general. If not yet I might be of some assistance, but I need some info from you as to why and who are you. Thank you for your reply. My name is Chris Truett and I am a teacher at Monroe Woodbury High School in NY. In the past I have asked on various message boards if anyone knows how to contact him. You are the only to respond I have received. I have seen two video interviews, one on the PBS archives website dated 1980 and done in Vietnam and a more recent interview on youtube. I traveled to Vietnam in 2007 in hopes of gaining a better understanding of the two sides who fought after the US left in 1973. I have great admiration for the General and if I were able to interview him I would submit the interview to various publications. I plan on returning to Vietnam and one thing I would like to ask him at the end of our interview is if there is anything he would like me to bring him back or do for him while I am there. My email is teamtruett@yahoo.com Thank you for your assistance! Hi Minh, I am trying find him for my father, who worked with him during the war. He would really like to re-connect. Are you able to help my dad get in touch with him? Hey Chris, were you able to find his contact info? My dad worked with in the the Vietnam War and would like to find him! Hey Joe, did you have any luck? My dad is looking for Le Minh Dao that he worked with in Vietnam. Still looking for Dao for an interview myself…. 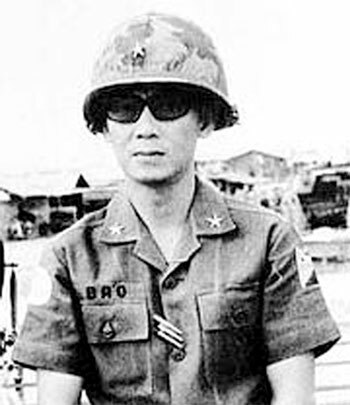 The actions and the words of General Dao in 1975 portray a man who seemed to have been underestimated by the Americans, by his fellow ARVN officers, and by his enemies from the North. Those of us Americans of non Vietnamese descent who know the story of the 18th division at Xuan Loc owe General Dao and his men a great debt of gratitude. It was officers and soldiers such as this who kept the threat of communism down range, away from the shores of America. Thank you all so much for your sacrifices and for your determination to hold on to what little you had left in 1975. May your story never be forgotten. Mr. Mark, I try to have my dad write a book regarding his life in prison. But I understand it will be too painful for my father and for all of us to look back at those awful and painful days. We are forever indebted to the courageous sacrifice of so many South Vietnam soldiers and civilians. Evidences have proved Vietcong are the ferocious invaders, greedy aggressors . I would like to read a biography of Le Minh Dao if one is out there. If there is not one there should be. Consider that after he is a true hero and should be remembered in Vietnam’s history always, but also that he survived 17 years in “re-ed ” camp. Thank you for your request and your interest in my father General Le Minh Dao. I happened to search the web for our old homes in VN prior to the communist took over our properties and land that we once own. I ran across this site and was very impress with your interest and sincere to learn about my father. There are nine children in the family. I am one of the 7th children of General Le Minh Dao. My father is alive and well and so are all of us. I’m not just some random person replying to this blog. I recently visit my dad. My father is in his early 80th now. My father been through a lot. He suffered tremendous tortured when he was a POW for 17 years. The day they took him was my birthday “May 9, 1975”. I was born on May 9, 1968. Since I was one of the 3 youngest children, I never have a chance to grow up with my father and so were my other siblings. Therefore, we try to spend as much time with my father for whatever time God give him to us. My father converted to Christianity while he was in prison and through the grace of God he was able to survive and still living in faith. As 3 of the youngest children we were converted to christian when we arrived in America in 1978. There are so much to talk about my father. I wish I can share more with you all. But for my dad safety since he is still very active against communism, I have to keep in private. You can contact me via email chenmn1@gmail.com. By the way, you will see at the end my last name is “Chen” that is my married name. My mother maiden name is LE HANG MY. Daughter of the most famous and heroic general in the South Vietnamese. Michelle, I am so impressive with your writing. My uncle is one of your father”s men who died in the battle fields. His name is Nguyen Van Thoai; he”s accompanied your father from Dinh Tuong province to the 18th division. He was major at the time he died. In the annals of history, there are few such instances of such noble heroism and defiance in the face of such impossible odds. 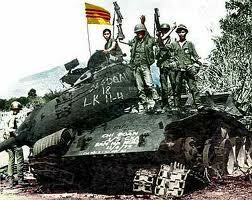 The true honor is eternally that of the men of the ARVN making their last stand at Xuan Loc. It is with my deepest condolences that I write this letter to them and their families – but I cannot now say much to add to the glory which is eternally theirs. As a man of a younger generation, it is my heart-felt regret that I could not have stood by their side and fought with them.